Hey guys! Bea here, ready to share more arts with you– and in this case, more old sketches for Illustrations I hope to make very soon! 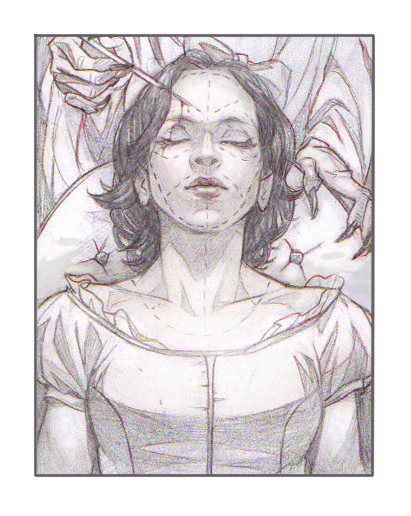 Introducing– the Twisted Fairy Tales sketches! Like many young girls, I was introduced to fairytales through Disney– with some of my favorite films being The LIttle Mermaid, Beauty and the Beast and Peter pan. But, when I got older, the neat little happy endings in movies stopped working for me as much, so you can imagine how fascinated I was when I realized that the original tale to many of these stories were a lot darker than the Disney versions. So– about five years ago, I decided I wanted to do a series of illustrations focusing on the dark side of some of these fairytales, by either reinventing them in my own way, or paying homage to the originals. That said, lets take a look at the first sketch! 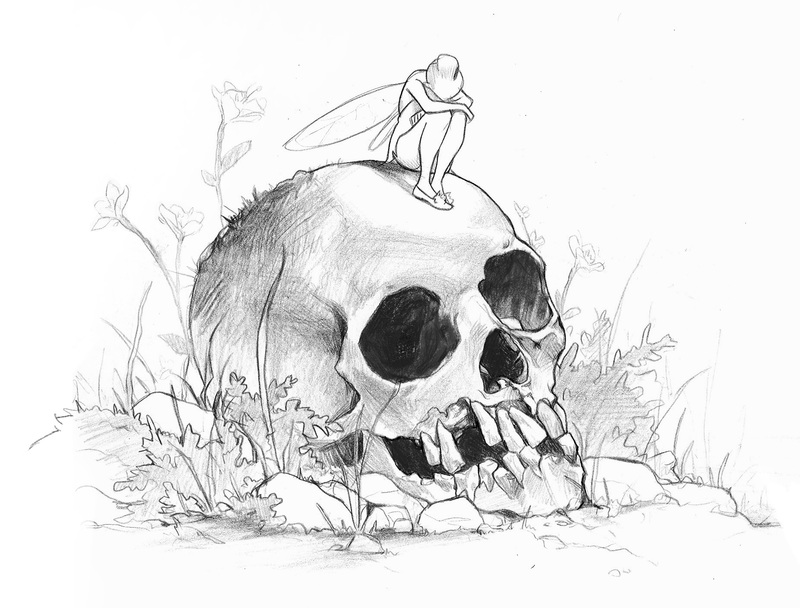 Tinkerbell and Peterpan.This sketch is very old, so I don’t know exactly what was going on in my head when I drew it lol, but I can say it’s a concept I want to finish and what comes to mind now when I see it. I don’t know anyone who wouldn’t want to be “forever young”. The young want to stay beautiful and the old long for the days of their youth, as it were. But, life can be tragic in the real world, and eventually the “fairy dust” looses its effect. At least that’s what happened to Pan here. This sketch doesn’t follow the same format as many of the others you’ll see, but one thing that is highly emphasized in Disney princess movies is, well… beauty. But, what happens when those princesses start to lose their good looks? In a weird way, I always thought of the wicked queen and Snow white herself as kinda the same person. Of course we never get to see the evil queen in her young days, but, the mirror suggests that she was fairest at one point, right? Like, maybe once upon a time she was beautiful– sweet and innocent too, and if that were the case, I bet she got a lot of attention for it, much like Snow White does. But, she couldn’t stay young forever, so she kind of sold her soul to find ways to get back what she lost, and became wicked and bitter in the process. Whose to say, The even queen isn’t a…reflection of what Snow White could become? And if so, what measures would Snow White take in a modern day to keep her youthful looks? Taking a step back, after seeing Snow White and the Huntsman, I tried to see Snow White from a different angle. Some of you may know it, but in this version of the story, Snow White fights the queen and wins…but all the same, I still see the two as kinda one person– at least in spirit. Wouldn’t killing the queen, in essence, make her un-pure? What if, in shedding the queen’s blood, that darkness passes on to her…what if all of this is some game on the mirror’s part? Either way, Snow White is an interesting one because I can entertain so many ideas with it! If you’re not familiar with the original story of the Little Mermaid, when the Prince falls in love and marries the other woman, the mermaid is given a choice. She could either stab the prince, and let his blood fall on her feet or fin, breaking her bond to the witch, allowing her to return to the sea with her sisters, oooooooor, turn to sea foam and basically die. In the original verson, The mermaid chooses to spare the Prince’s life, because she loves him too much to shed his blood. In this one, the mermaid makes the opposite choice and her sisters are all there rooting for. Why Did I do this? 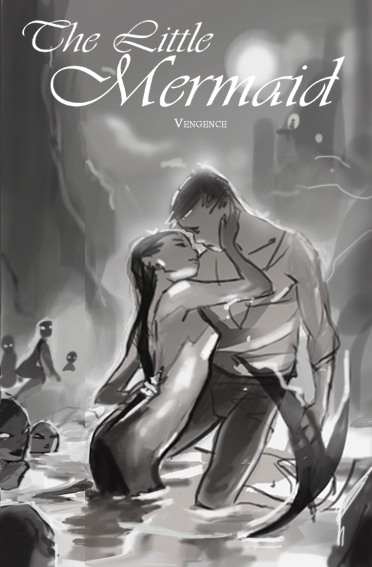 Well, mermaid are sirens– and I wanted to combine their true nature with the love story. So in essence, instead of dying, The mermaid becomes what she was born to be. She becomes like her sisters. Ironically the two sketches kinda tell a story. 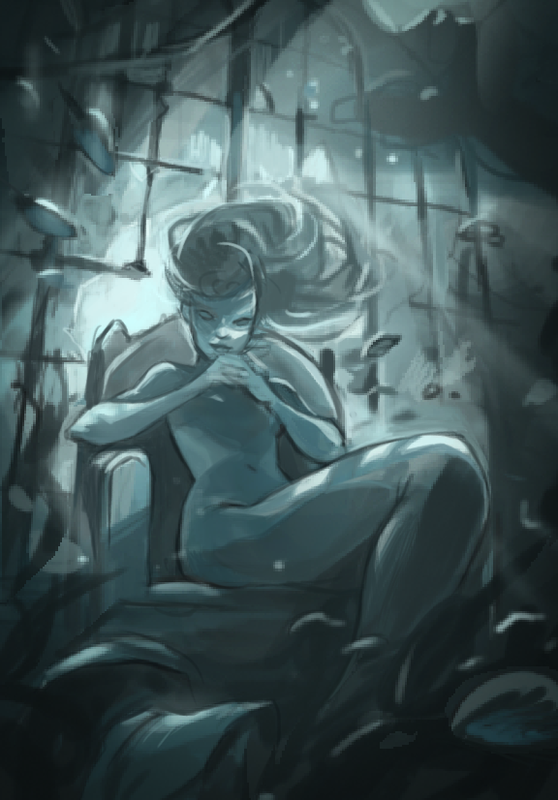 In this version,the little mermaid, whose heart has been blackened, sits in the sunken ruins of the creatures she once loved, which could, quite possibly be the ruins of a ship that fell due to her and her sisters luring songs. I know it seems a trend, considering the princesses all seem to get black hearts, but I can’t help it. I find the dark side interesting >_< Besides, I heard they have cookies! Anyway, these were just early sketches of my 3 strongest concepts from the series. I do intend to tackle Red Riding Hood, and Alice in Wonderland, among others, when the ideas come for them. Either way, I hope you liked this post, as you got to see some of the sketches I’ve kept hidden away for the most part! More to come soon 😀 Till next time, Enjoy!